From August 8-10, the European Union Advisory Mission (EUAM) carried out a working visit for a delegation from the National Anti-Corruption Bureau of Ukraine (NABU) and Specialized Anti-Corruption Prosecutor’s Office (SAPO) to Latvia – led by NABU’s Director and Deputy Director, Artem Sytnyk and Gizo Uglava, and the Specialized Anti-Corruption Prosecutor, Nazar Kholodnytsky. Over three days in Riga, their Latvian counterparts shared their experiences of investigating corruption. It was agreed in principle to sign a Memorandum of Understanding between NABU and the Corruption Prevention and Combating Bureau (KNAB) of Latvia while discussing future cooperation, mechanisms and anti-corruption measures with the Director of KNAB, Jaroslavs Streļčenoks. The Ukrainian delegation also visited the Internal Security Bureau and held a meeting with the International Co-operation Division of the Prosecutor’s General Office of Latvia, where close co-ordination in processing of requests for international legal assistance was addressed. 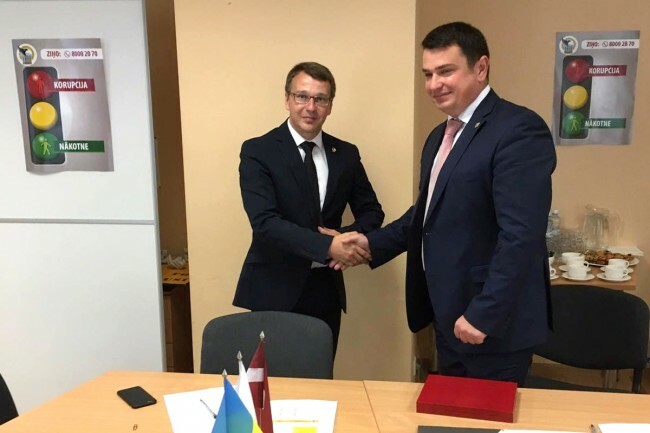 “Considering the quantity of illicit financial flows from Ukraine to Latvia, effective co-operation between NABU and law-enforcement agencies in Latvia is of high strategic importance when it comes to fighting financial crime,” highlighted EUAM’s Senior Anti-Corruption Advisor, Clemens Mueller. During the visit to Latvia, the NABU/SAPO delegation became acquainted with planning and implementation of Latvia’s Anti-Corruption Strategy, learned more about monitoring systems and anti-corruption project analysis. They also received an update on the legislative framework, public awareness about corruption, and preventing corruption in the system of public administration and the business environment.